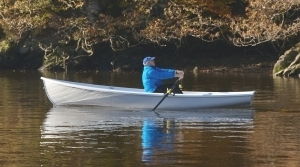 Recreational rowing can be as simple or technical as you wish, with a Westport Jolly Boat the basics can be picked up easily in no time at all. Follow our basic techniques and tips to get started or contact your local British Rowing club who will run beginner courses, teaching you the basic techniques and helping prevent bad habits forming. In general your stroke should be efficient, well balanced and smooth, concentrate on technique rather than power. The sliding seat enables you to use your legs to help propel the boat forward. Feathering is the turning flat of the oar blades as you release them from the water at the end of the stroke and the turning perpendicular again right before the catch, where you put them back in the water. Feathering makes it easier to extract the blades from the water, cuts wind resistance on the recovery, and makes it easier to row in choppy water. If you are learning to row then try to master blade feathering as early as possible, it soon becomes a natural instinct. The catch: At the start of each stroke and it is the moment when you place your oar into water. 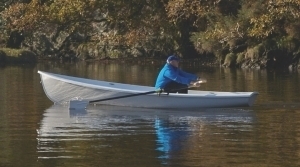 Your legs should be pulled up with your shins vertical and you should be positioned towards the aft end of the boat with your sculls (oars) pointing forward. The blades should enter the water with minimum splash with the blades ready to pull. The drive: As you begin to push with your legs, you are entering the drive of the stroke. The legs should be doing most of the work here, with the arms relaxed and the back still straight and leaning forward. The pull: Nearing the end of the drive phase the body swings back and you begin to pull on your arms to maintain the stroke. You should aim to finish your leg, arm and back pull together. Your legs should be flat, your arms pulled in and your back should be straight and leaning back slightly. The recovery: The entire process is repeated, each movement flowing into the next, forming another stroke. Drop your hands to raise the blades, feather flat, then reverse the drive actions to start again: push the arm away from the body, bringing your back up into the vertical position and once completed allow your legs to pull you back by raising your knees. Finally feather the blades vertically ready for the catch. In developing your technique and especially for those of you wishing to develop your recreational and touring rowing don’t forget to Glide! You will find that by allowing your boat to glide through the recovery stage you will increase your stroke efficiency. Keep your recovery smooth and try pausing slightly before the catch and you will soon find yourself rowing for longer with less effort. Don't Forget To Look Where You Are Going! When out rowing, even in open waters, your boat will seem to be attracted to all buoys, floating debris, other boats, etc. – having suffered many embarrassing entanglements I have learnt my lesson (mostly) and now regularly check my course. Use your boats wake (trail of disturbed water behoind your boat) as well as fixed objects directly behind you to help keep your cousre straight. If you venture along the coast then you will need a fixed compass mounted aft to keep a straight course. Due to the boats resistance increasing at a much higher rate than speed you will find that to row faster will require increasingly more effort for less and less gain in speed. For recreational rowing and touring aim to row at a steady pace as near to your average speed as possible, this will reduce your effort and increase your range. For fitness and training purposes you will want to row faster for short periods of time followed by slower recovery periods. Here the increasing resistance with speed works well to provide a greater resistance to increase muscle strength, calorie burn and with regular training weight loss. Your local rowing club and coaches can provide all the necessary assistance and advice. 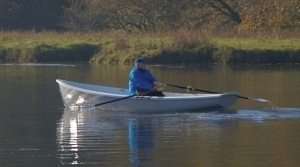 When learning or developing your rowing technique you can concentrate on any one aspect of the stroke by just repeating that aspect, i.e. you can focus on your leg technique by keeping you back and arms straight and only rowing by pushing with your legs or visa versa. By using focusing for short periods during your row you can quickly improve your overall rowing technique and efficiency. Regularly check and maintain your boat, sculls, throw lines, bailers, anchor, etc. 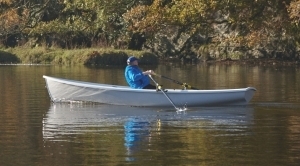 When rowing alone or on open water always take a buoyancy jacket and plenty of warm clothing. Have the means to establish your position in an emergency, (map, charts, GPS, compass), know where you have come from, where you are and where you are going, especially when rowing open or unfamiliar waters. 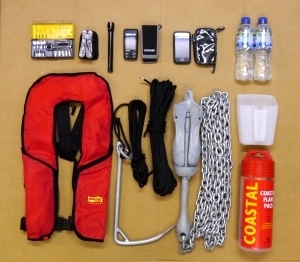 Ensure that you have suitable signalling equipment for use in an emergency; simple arm signals, whistle and flashlight on sheltered waters & rivers; flares, VHF radios and EPIRB (emergency position indicating radio beacons) for open water. Plan your route and make sure that a responsible person knows where you are and when you should return. If possible make note of rest areas and alternative stopping points in case of the unexpected. Always check weather and tides. Plan to finish rowing with the tide or wind behind (whichever is strongest). Be aware that strong winds can push the boat off course and combine with tides to create unexpected choppy and difficult conditions. Never row in conditions that you are uncomfortable in, row in company or stay ashore. As you gain experience and familiarity in your boat you will naturally become more comfortable in an increasing range of conditions, this is a gradual process and you should always be aware of your limitations. Avoid rowing at dusk and in the dark. Practice water enrty, capsize recovery and towing whenever possible. Plan for the unexpected; broken equipment, personal injury, helping others, etc. Always take drinking water: dehydration reduces muscle output, concentration and reaction times. Always be responsible in your rowing and be aware of other boats, water users and wildlife! All waters have Codes of Conduct and are subject to local By-Laws and Rules. It is your responsibility to make sure that you abide by these. 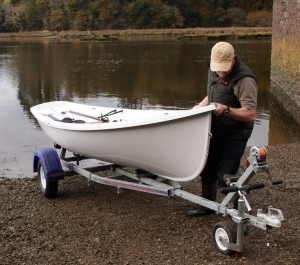 The Jolly Boat can be launched, recovered and towed almost anywhere with a suitable road trailer. Depending on the type of trailer the towed weight for the boat and trailer (gross weight) should be less than 250kg, so even the smallest of cars can be used. If you have two boats, then you can carry both boats on one trailer when fitted with a boat rack, thus reducing your storage footprint while opening up the potential for touring in groups. Europeans tend to prefer roller trailers where the boat is supported by a series of pivoting rollers that allow the boat to be pulled up onto the trailer. Across the Atlantic our American and Canadian friends prefer to use padded boards, called bunks, to support the boat. Bunked trailers require the trailer to be immersed into the water to float the boat on, however Roller trailers do not need to get wet, reducing trailer and bearing corrosion. 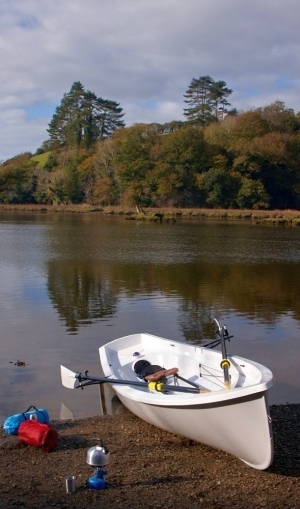 Where your boat is stored at your local boat park then Launching Trolleys are ideal. 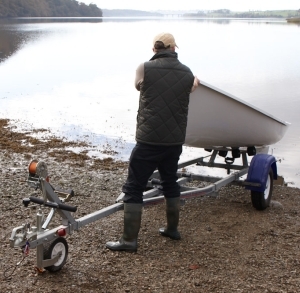 A Launching Trolley is a very simple, light weight frame and wheel set that allows you to walk your boat down and into the water. Due to their light weight and simplicity, launch trolleys can be used by all ages and abilities, proving to be a low maintenance and reliable method of launch/recovery. We have found Launching Wheels to be of most benefit in accessing launching sites that are not car/trailer friendly i.e. river banks, foreshores, beaches, etc. Launching wheels are typically fitted to the underside of your Jolly Boat, towards the transom and secured with a strap over via deck cleats. Then by lifting the bow it is possible to pull your Jolly Boat down to the water. 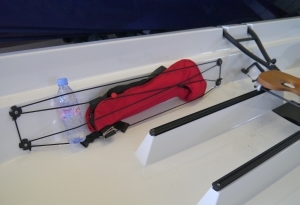 Some launching wheel sets are folding with detachable wheels allowing storage inside the boat, so no need to trek back to the car with the wheels. Lifting points can be added to the Jolly Boat to allow lifting either aboard larger Yachts/Motorboats or by your pontoon davits/dockside crane. Four lifting eyes can be located just inside the sides of the Jolly Boat, two forward and two aft aligned with the internal bulkheads. Strops can then be clipped on for lifting. 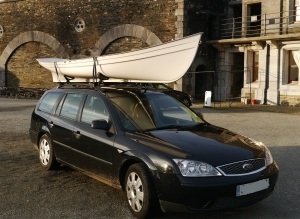 The Jolly Boat can be transported on your roof rack, (subject to maximum load ratings for your car – check the handbook), with the addition of simple boat pads attached to your roof rack cross beams. Lifting and removing the boat from your roof rack is best done by two people, but correctly rigged with a rear ladder roller a Jolly Boat can be loaded and removed by a single person – from behind the car lift the front of your Jolly Boat up onto the rear ladder roller, then move aft and lift the back of the Jolly Boat, pushing it forward and onto the roof rack. Whether you load your boat alone or with help be aware that you will be lifting half the boat weight up to shoulder height, so please think ahead and lift safely and responsibly.